This note illustrates several examples of range folding on the NWS WSR-88D (NEXRAD) doppler radar system. These were observed after the disastrous breakup of the Columbia Space Shuttle over western Texas. This event left a large linear area of radar reflectivity across part of East Texas. As this note shows, radars aligned with this deposit showed range folded echos of the phenomenon. 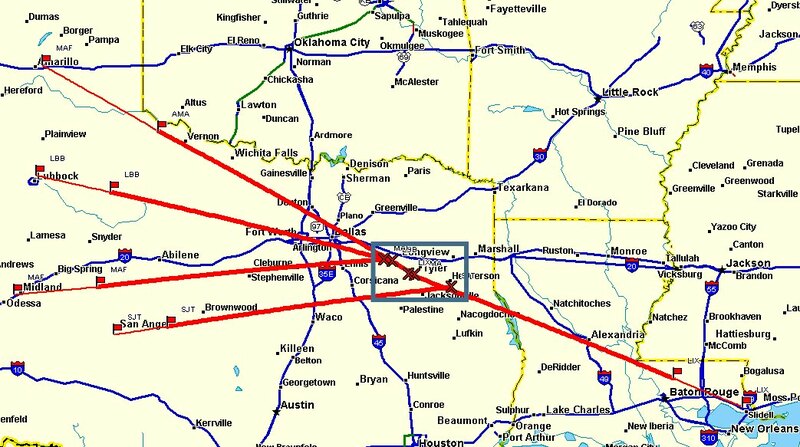 The shuttle broke up at almost exactly 1400Z at an altitude of about 200,000 feet at a speed of Mach 18, apparently near Waco, Texas. Debris was subsequently found around Lufkin, TX and searches continue. Shreveport first shows the actual (non-aliased) return at 1405 (click for an elarged image). This return expanded and spread over time, lasting for at least 12 minutes. This can be seen in this sequence from the Lake Charles radar. Accurately plot a bearing line from each radar location to flag at the echo. Extend that line along the same bearing for 285 miles. Plot a large "X" at the end of that line. Draw a box around all of the endpoints. The results are pretty dramatic. All of the end points fall along the debris path in the area of highest density debris fall. The radars at Amarillo, Lubbock, San Angelo, New Orleans and Midland show echos correlated with the debris fall. These return appears to be range aliased - especially since the location of the return is different for each radar, but they all point towards east central Texas where the debris has been found.